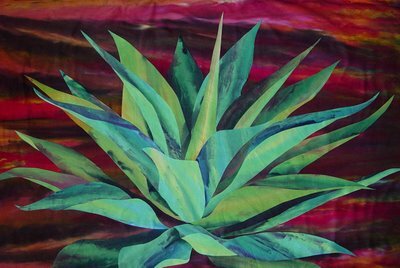 I have been dyeing more green fabric to work on two other agave quilts. 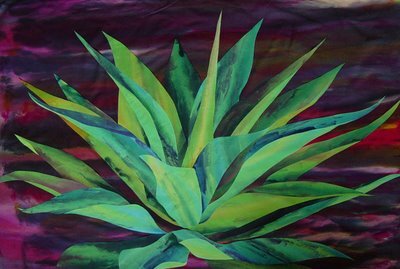 I still have not resolved the background of the excisting agave quilt, so maybe if I just move forward with the other two I will figure it out. I have been dyeing fabric with this pouring method lately, it seems to give me good variations in color and value. 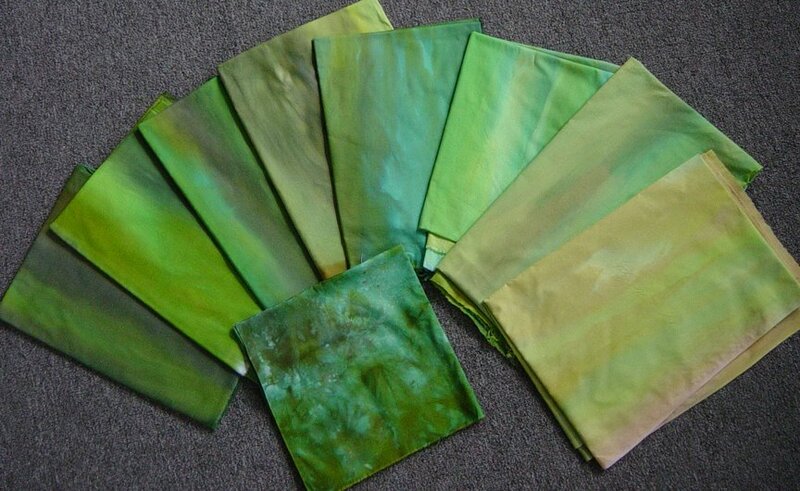 Some have a beautiful watercolor painterly quality. but they did not seem to be quite right. The agave is beautiful, Judy! I was going to suggest the compliment-red to green--for the background, but you tried that. The agave on the red is sort of sci-fi looking. Not bad. You could always add green to the red to neutralize the tone. But that might be too quiet. What would the sky be looking like behind these plants? Make up a story or a fantasy and choose a background to go with it. 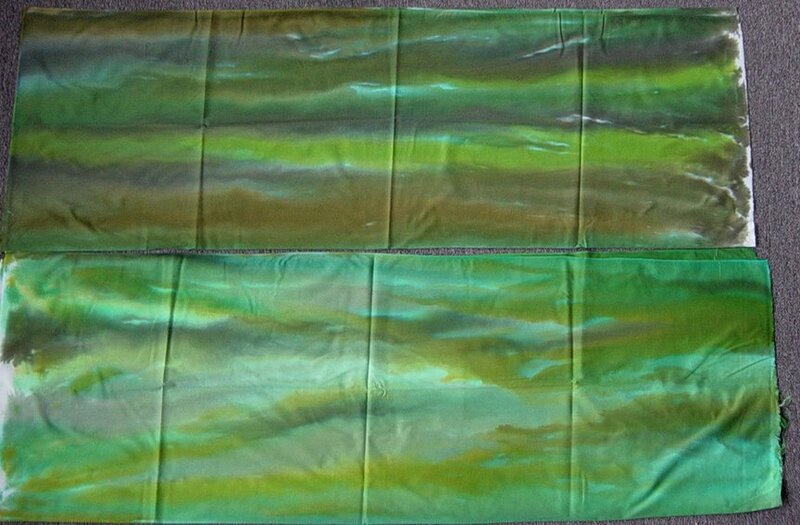 I like the dyed stripes--very nice! Are you dyeing out on the roof top? I would image it is really cookin' out there if you are. Maybe a lighter value of orange like a sunset in desert for the background? Red would be good but that red is too broody...you need something brighter. If not red, try some blues but pale with some pink/salmon maybe?? 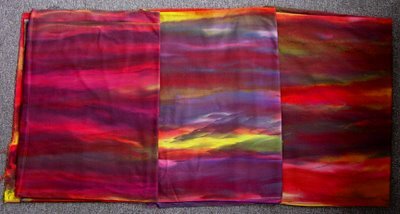 I think Laura has the right idea with orange but I think it might be worth trying the orange streaked with purple, which I've seen so often in the desert sky as the sun begins to set. My 2 cents...I think you need more value difference between the background and the plant, but I like the idea of the reds. 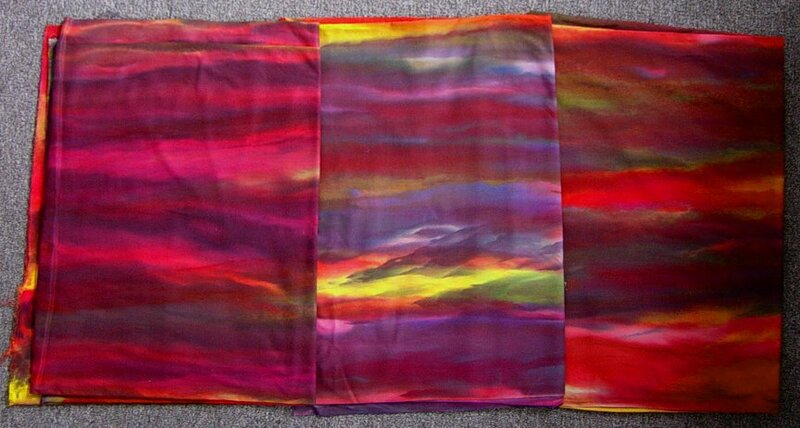 In the photos of the reds you dyed I really like the center one...what a great piece to use as a sunset on it's own! I love the purple, but maybe a lighter value.